For the spectacular oyster roast that has long been a November tradition in my wife’s family, I am tasked with the Bloody Mary bar. Years ago, when I first began making my own Bloody Marys, I spent hours researching what makes a great one. After lots of reading and experimenting, I reached a firm conclusion: the key to a good Bloody Mary is good tomato juice. This shouldn’t come as a surprise. After all, a Bloody Mary is mostly tomato juice. Just as good water makes good coffee, good tomato juice makes good Bloody Marys. But, for whatever reason, a myth has grown that other mysterious, secret ingredients are essential to a great Bloody Mary. Classic 80s sitcoms did nothing to quash the myth, like the Cheers episodes about Bloody Mary contests against Gary’s Old Towne Tavern. In my view, all you need for a great Bloody Mary is great tomato juice and decent Vodka. After that, it’s just a matter of personal taste. Do you like it heavy on the umami? Add extra Worcestershire sauce, or something more exotic like anchovies, beef consomme, soy sauce, or fish sauce. Perhaps you like spice. Then add your favorite hot sauce, cayenne pepper, and/or lots of horseradish or even wasabi. And, finally, if you’re like me, you’ll want a healthy dose of lemon or lime juice for some acidity to thin it out and liven the flavors. Season to taste. But, all those things are beside the point unless you start with great tomato juice. This is one reason that I’ve never found a bottled Bloody Mary mix that rivals the ones we make at home. They’re doomed from the start. Bloody Brilliant is just that. It’s a mix from a new company called Back Pocket Provisions, founded by former The Rock Barn employee Will Gray and his sister. 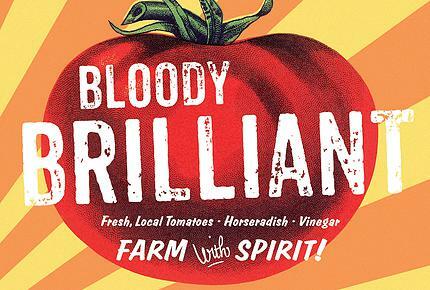 “To make a better Bloody Mary mix, you need a better tomato,” touts their website, speaking my language. Thus, they start with pressed locally grown Virginia tomatoes. Partners from the 2015 growing season include Critzer Family Farm, Dodd’s Acres Farm, Double H Farm, Shady Lane Family Farm, The Local Food Hub, and Virginia Food Works. Sure, they’ve got some other ingredients in there, like horseradish, anchovies, and cayenne pepper. But, the local tomatoes are the stars of the show. I served it at the oyster roast last weekend, and what a hit. Raves all around. Guest after guest asked about it. Keeping the pitcher full seemed a task for poor Ali Sard. The faster he fills it, the faster he empties it. Look for it at Ivy Provisions, Feast!, and Timbercreek Market. Or, order it online from Relay Foods. Or, if you don’t want to pour your own, buy one at Rapture and The Ivy Inn. But, whatever you do, try it.